MoonMarble.com - Joshuah Justice - "Wizard Marble"
Art Glass → Contemporary Handmade Marbles → Joshuah Justice - "Wizard Marble"
Joshuah Justice - "Wizard Marble"
This is a handmade contemporary marble by Joshuah Justice. 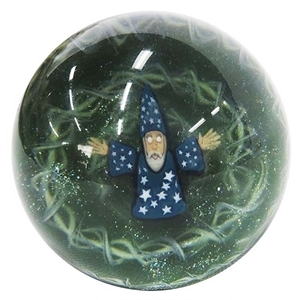 This is a clear marble with a wizard murrini in the center. The wizard sits inside a green background with a twisting white cane wrapping around it. The back of the marble is lavender purple with dots of aventurine green stacked on top of black dots. Also contains glass that glows under a uv light. Approximately 1 5/8"+ in diameter.